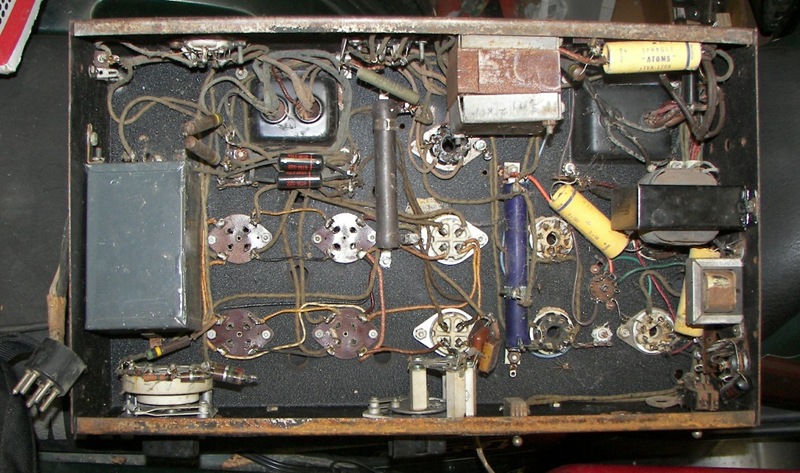 This used six 2A3's or similar 4-pin power tubes in parallel. It would have been placed in series with the cathode or filament of a large power tube to allow a CW transmitter to be amplitude modulated. This arrangement was not very efficient, but it avoided the need for an expensive modulation transformer and costlier high-power modulator tubes. 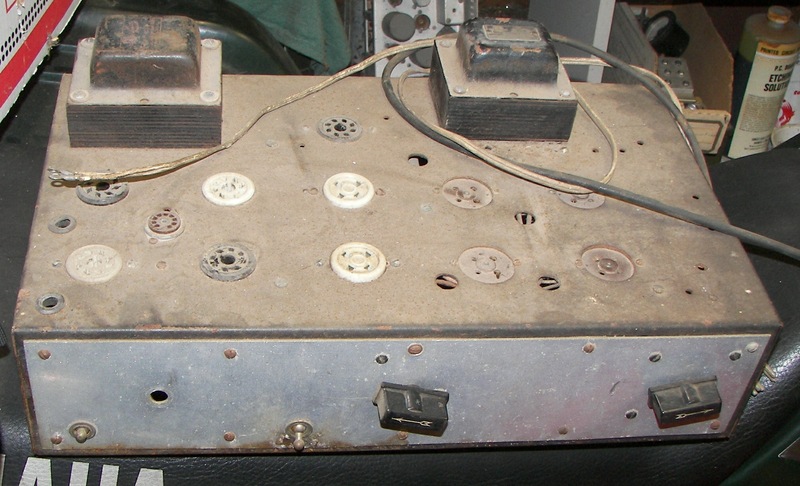 It could also have been used to key the transmitter for CW. 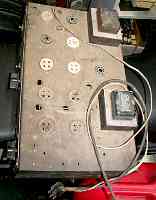 The evidence that it is more than a keyer is the large number of other tube sockets and the two power transformers, consistent with the requirements of some kind of low power audio amplifier stages. 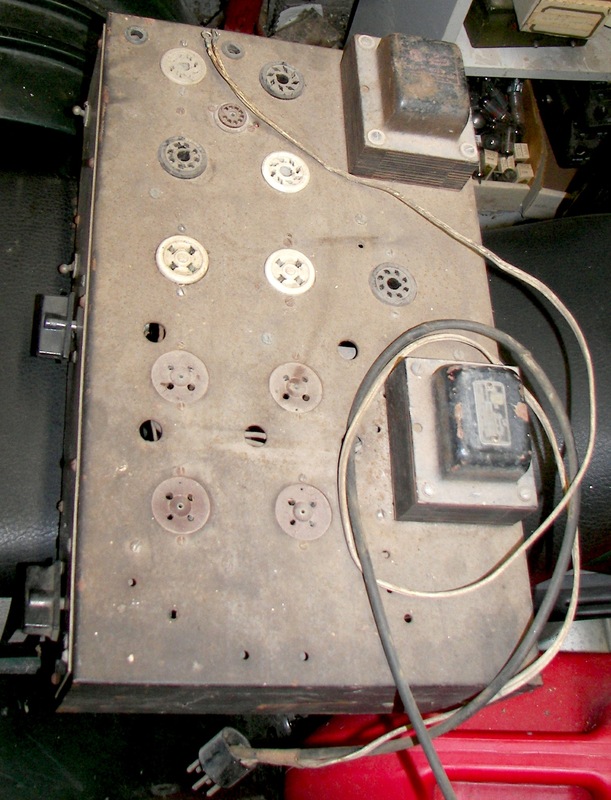 The 9-pin socket and small transformer with the silver frame seem to have been added later, perhaps a decade or more after the unit was first built. The principle is simple. The cathode modulator's series-pass tubes are in series with the cathode of the modulated stage, so that the amount of grid bias on the series tubes determines the amount of current flowing through them. The current through the pass tubes will have a definite maximum level depending on the current carrying capacity of them and also the amount of curent the RF amplifier can draw. If the pass-tube current is set to about 1/2 of maximum, then the carrier level will be about right for AM. The average DC plate voltage on the RF amplifier never changes. A small, low voltage / high current tube arrangement like this could control a much larger RF amplifier. Although it has to pass the full current required by the RF stage, it only has to withstand enough voltage to completely cut off the stage against the RF drive on the RF stage grid.